Something that’s started to interest me recently when it comes to clarinet writing and collaboration with composers, is the generation of material. I love these long collaborative meetings where you just sit together and generate material for its own sake. And I love seeing what makes it into the piece later, and what doesn’t. That’s basically what my whole PhD was about. It seems to me that a lot of the time when working with composers, generating material comes down to things like “well, that’s great, but can you do a and b… at the same time?” It’s all about layers, and isolation of various bits of the instrument and then layering all those isolations. Fun stuff. And it’s about developing an understanding about how certain aspects of the instrument function and how you can use them. Sometimes this is about taking one note and adding layers of different articulations, singing, multiphonics, etc. on top. Today, I’m going to show you how manipulations of the register key can generate some beautiful and interesting effects, and while the effects are beautiful in themselves, I think/hope that for composers who are interested in isolating various aspects of technique, this could also prove to be interesting on that level. So, perhaps you’ve worked with younger, less experienced players and you’ve noticed that sometimes (or perhaps all the time) when the clarinetist plays in the second register, especially when articulating, you can hear the untertone of the register below coming through. We work really hard to get rid of that, and there are a lot of exercises to work on it. One thing that works really well is having someone push the clarinetist while she tries to play certain notes, while pushing back to as not to fall over. Some combination of distraction and engaging the muscles seems to do the trick. Another thing that works well is this exercise. Start at the top of the register (here I play a written B), remove the register key (you hear the pitch go down by about a quarter tone) and then try to play a chromatic scale downwards, keeping the pitch in the second register (despite not having the register key down) as long as possible. Hear how it becomes more difficult the lower I go, until I drop into the bottom register? These harmonics can be controlled much in the same way that spectral multiphonics can be controlled (and the pitch material is essentially the same), but they have to be kept at relatively quiet dynamics. As soon as I push too hard, the second register is too heavily activated, and the harmonics are then limited in number and very squeaky. 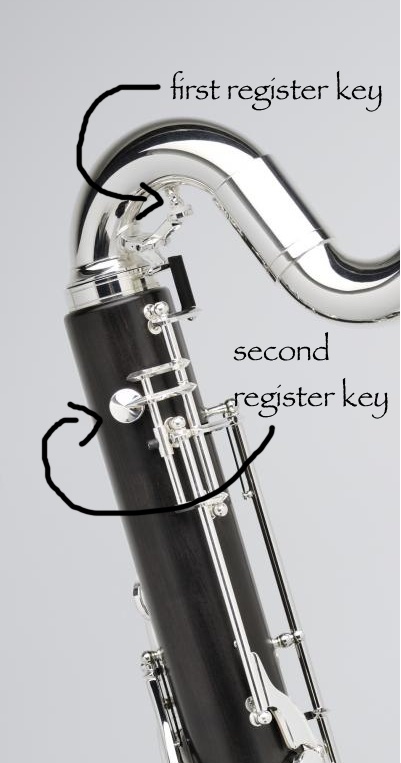 The other thing about the bass clarinet, which is definitely worth knowing, is that it actually has two register keys. Please get in touch if anything about this post is unclear or if you want more details about a certain aspect of the technique. I’m so far ‘inside’ the technique on this one, I’m not sure I can tell how clear I’ve been! This entry was posted in clarinet techniques, multiphonic, on composing for the clarinet, performance, register key, trill and tagged bass clarinet, clarinet, collaboration, composers, contemporary clarinet technique, contemporary clarinet techniques, contemporary music, multiphonics, new music, register key, trills. Bookmark the permalink. Reblogged this on Jordan Randall Smith. Hi Heather! Thanks so much for all this hard work on behalf of us composer. I’m wondering, in regards bass clarinet, if one can start on a note in the lower – mid register, and use either register key to effect a kind of grace note that would go momentarily very high? If not, how might this be achieved? Hi Blasio – Yes, moving upwards quickly like this is very easy to do with the register key (I hope I’ve understood your question correctly). Best wishes!